The ancient village of Iffley ("Givetelei" of the Domesday Book) occupies a rocky promontory on the east bank of the Isis, some two miles south of the centre of Oxford. 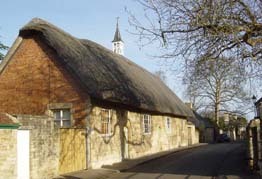 Until the 19th century, the main road to Henley ran along Iffley Turn and through the village. The northern end of the old village is marked by Tree Lane (a medieval sheep-way) and the Tree Hotel, where the Old Tree Inn once stood. Towards the end of the 18th century, wealthy citizens of Oxford began to build country houses within easy reach of the city and the village expanded to the north by the addition of large houses in landscaped grounds, of which a number still remain with their heritage of fine trees. By the middle of the 19th century, the agricultural village was already acquiring its present, residential character.